The Ohio state Senate unanimously passed legislation setting strong new renewable energy and energy efficiency standards last week, sending the bill on to Governor Ted Strickland for signature. Sub. Senate Bill 221 establishes a 12.5% by 2025 renewable energy standard (RES), making the Buckeye State the 26th state in the nation to adopt a renewable energy requirement for electric utilities (see this previous post on numbers 24 and 25). The legislation also includes a strong energy efficiency standard that is expected to result in a 22% cumulative reduction in energy usage by 2025. According to the American Wind Energy Association, the Ohio RES is expected to result in 5,000-7,000 MW of new wind power capacity by 2025 and early-year targets will drive 650-750 MW of new wind power installation over the next 4 years. The bill also includes a small solar "set-aside" to help boost solar power in the Buckeye State. To ensure significant in-state renewable energy development, at least half of all new renewable energy generation must occur in Ohio, and the other half can occur in neighboring states. The legislation is expected to help jump start interest in wind and solar manufacturing in Ohio's world-class manufacturing centers and could spark a "green collar jobs" boom in a state that has been hurt by the steady loss of manufacturing sector jobs. The renewable energy legislation has national significance. 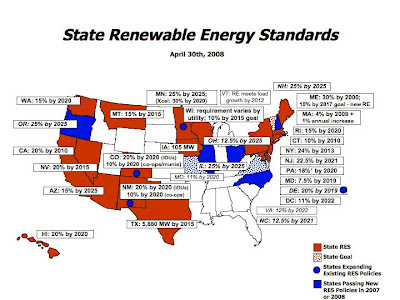 As Ohio becomes the 26th state to adopt an RES, the majority of US states now have renewable energy standards on the books. In addition, Ohio is the fourth largest electricity consuming state in the nation (behind only Texas, California and Florida), ensuring that this state policy will move the needle nationally for renewable energy.